Schwinn is a company that is exceptionally good at manufacturing indoor and outdoor bikes. 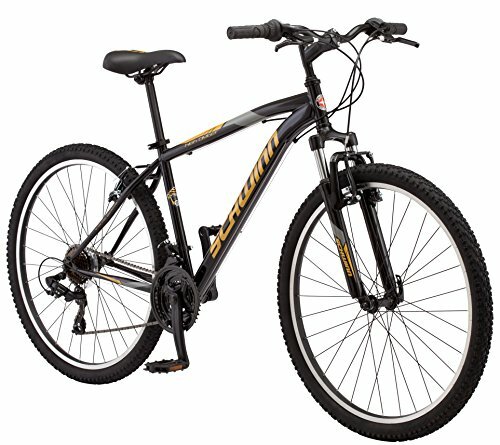 Be it hard trail riding or just casual day to day street riding, Schwinn High Timber Men’s Mountain Bike can prove a worthwhile purchase for you guys. If you are a casual biker, you will love the features of Schwinn bike. It provides top casual biking experience and within the price too. Features like linear brakes, SRAM twist gear shifters, and 21 different speed levels are very handy on your daily journey through the roads. Let us review Schwinn High Timber Mountain Bike in this article for additional benefits. It looks cool. With the gray colored frame, Schwinn High Timber Mountain Bike looks more attractive than most of its competitors. Schwinn manufactures the frames for the bike on its own. This frame is heavier than what we see on the market. But it is also durable, to say the least. It prevents the jerking of the cycles. The steel-made frame combats against rust and keeps the bike new for many years. The handlebars are at a comfortable height. You can adjust the seat. It comes off quickly for you to change it according to your height without problems. Bike Pedals are spacious to accommodate feet of different size and shape. One of the things I desired in my bike is the SR Suntour Suspension system. It is located just under the handlebars on the front wheel. Originally, this bike is designed for hard tail off-road ride. So, you can ride this affordable mountain bike on rocky roads. The suspension takes care of the bumps in the road. It eases out the jerking by providing maximum flexibility that you need. There will not be any rebounds thanks to the springs. The suspension is weatherproof also thanks to the anti-corrosive coating on them. This bike is not only good aesthetically, but it delivers the goods when it comes to speed also. The Schwinn High Timber Mountain Bike comes with 21 different speeds for you to choose from. The gear mechanism consists of another great derailleur from Shimano. This derailleur boasts of twist shifters. It is just like motorbike gear changing. You twist your ankles slightly and the gear shifts. There are busy roads and even rocky mountain roads where you need to change your gears quickly that is where this mechanism helps without any failures. As we are enlisting benefits of Schwinn High Timber Mountain Bike, naturally the wheels deserve mention. Schwinn High Timber Mountain Bike manufacturers went for 26-inch wheels. It is a good mountain bike, but these wheels balance out extra weight of the steel frame. The lightweight wheels grant you more speed. But when you face bigger obstacles in your road, you can face uncertain situations now and then. Thus, the bike fits the bill for casual riding and probably light trail riding. While all the other features of the bike are great, breaks are somewhat standard. The manufacturers have used Linear Pull brakes on this bike. The linear brakes provide immense stopping power, but the power is still less than what the Disc-style brakes would provide you. While it fails in comparison to the disc brakes, the alloy coating on these brakes allows them to resist corrosion for longer periods. The result, longer lasting brakes serve you for years. Schwinn High Timber Mountain Bike review has pointed out numerous benefits that this bike offers people. The best thing is, it balances the benefits with the price seamlessly. Even this bike has failures. Every bike does. But the trick is to know when and where to use it. It is best suited for light trail riding. But if you are a casual level biker and want this bike for roads, it works just fine. Many of the people face problems and shortcomings because they take Schwinn High Timber Mountain Bike out on steep hills. For an entry level mountain bike, Schwinn High Timber Mountain Bike is a perfect choice without second-guessing.